RDQ3-63 is CB type dual power transfer switch, mainly apply to the two power systems with neutral line earthed and rated current below 63A, rated voltage 230V, 50/60Hz, transfer between two power source when one power source fault, to ensure the power supply reliable and safety. 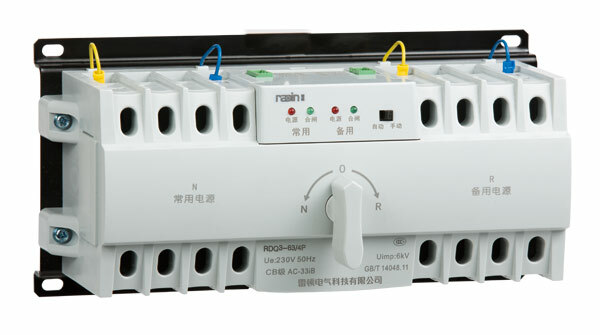 RDQ3-63 Series ATS usage category AC-33iB, electrical appliance grade CB class, its structure comprised with two MCB and accessories, mechanical interlock transmission mechanism, automatic controller, motor operation mechanism etc. Meanwhile the MCB inside the ATS have its original over load and short circuit protection function, can also used as ON/OFF and protection of the main circuit.